Forrest Gump once said, “College football is like a box of chocolates. You never know what you’re gonna get.” OK, so maybe that never happened, but it makes perfect sense if you think about it. Coming into each new season, you may think you know which teams will most likely win a national championship or which players are destined to capture the Heisman, but things don’t always work out as planned. And that’s the beauty of college football. Whether a preseason favorite is toppled or a dark horse comes out of nowhere to shock the country, in the end, a team’s fate is usually tied to the performance of its star player. If that individual is able to live up to the hype, then said team has a real shot at making a splash. If the exact opposite happens, well, better luck next year. The 2016 season is still in its infancy (obviously), yet plenty of individuals managed to put together noteworthy performances in Week 1. The way we see it, however, these seven players shined above the rest. Although the Notre Dame Fighting Irish dropped all the way to No. 18 in the AP poll following their opening-week loss to the Texas Longhorns, it’s impossible to overlook the superb performance from quarterback DeShone Kizer. The Irish may have entered the contest looking to utilize a two-quarterback system, but at the end of the night one thing was abundantly clear: This group is infinitely better with No. 14 under center. In Notre Dame’s 50-47 double-overtime loss, Kizer completed 15 of 24 passes for 215 yards and five touchdowns while also picking up 77 yards and another score on the ground. For those of you counting at home, that’s how a player accounts for six touchdowns. So much for quarterback controversy in South Bend. It’s not everyday that we find ourselves giving props to kickers, and just so we’re clear, we don’t plan on apologizing for that. However, when one of these specialists does something exceptional, we feel obligated to show that individual some love. So we tip our cap to Florida State kicker Ricky Aguayo, thanks to the sensational start to his college career. Aguayo isn’t just any freshman kicker, he’s also the younger brother of former Seminoles kicker Roberto Aguayo; you know, the guy the Tampa Bay Buccaneers recently took in the second round of the 2016 NFL Draft. Talk about pressure. Fortunately for the Seminoles faithful, like his big bro, Ricky also has ice in his veins; something we saw on opening night against the Ole Miss Rebels as he set a new Florida State record with six field goals in a single game. With that, we have just one thing to say: Roberto who? 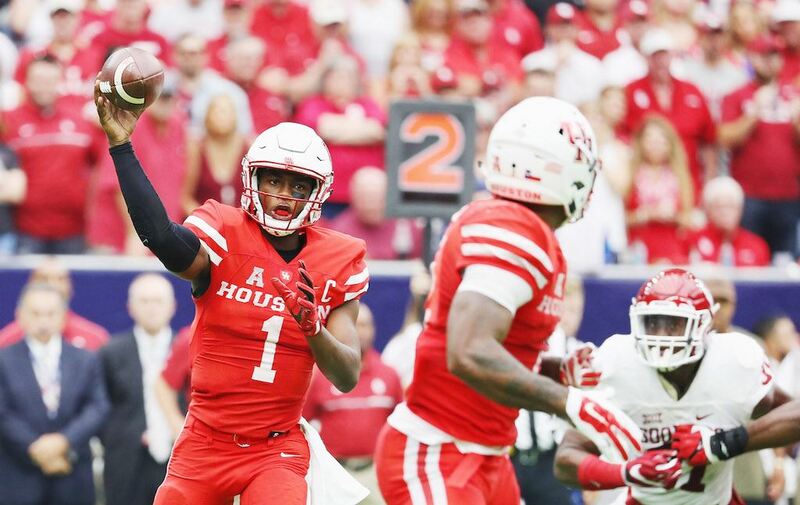 After leading the Houston Cougars to one of the biggest upsets in Week 1 of the new season, it’s safe to say that quarterback Greg Ward Jr. is on the verge of becoming a household name. Of course, if you’re unfamiliar with the explosive signal caller, don’t worry, we’ve got your covered. Against the previously No. 3-ranked Oklahoma Sooners, Ward was 23 for 40 with 321 passing yards, two touchdowns, and no interceptions. Best of all, with this victory, the Cougars finally earned some overdue respect, moving up nine spots to No. 6 in the latest AP Top 25. With Ward at the helm, the sky’s the limit for Houston. 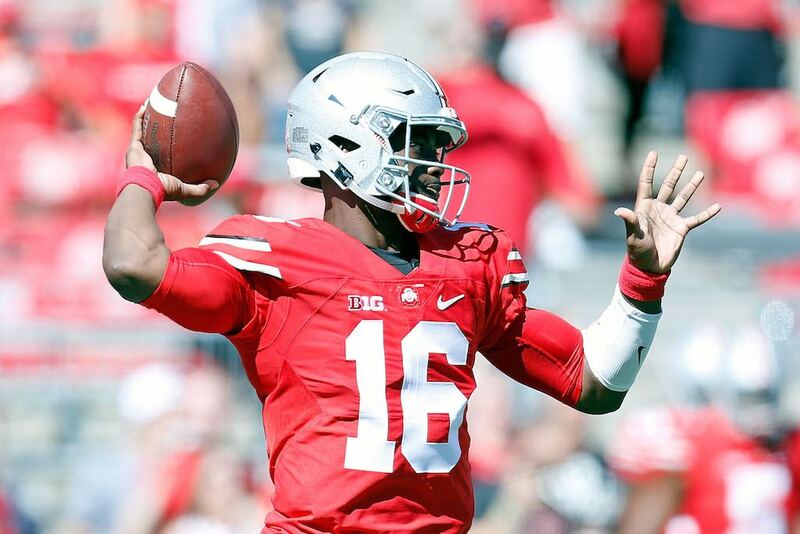 In Ohio State’s 77-10 victory over Bowling Green (yes, Bowling Green), quarterback J.T. Barrett showed why he is among the most explosive players in all of college football. The junior completed 67.7% of his passes, threw for 349 yards, and finished the contest with six passing touchdowns (and one interception). On top of that, Barrett also ran the ball for 30 yards and added another score on the ground. Sure, the competition may have been nothing special, but come on, seven touchdowns is still seven touchdowns. 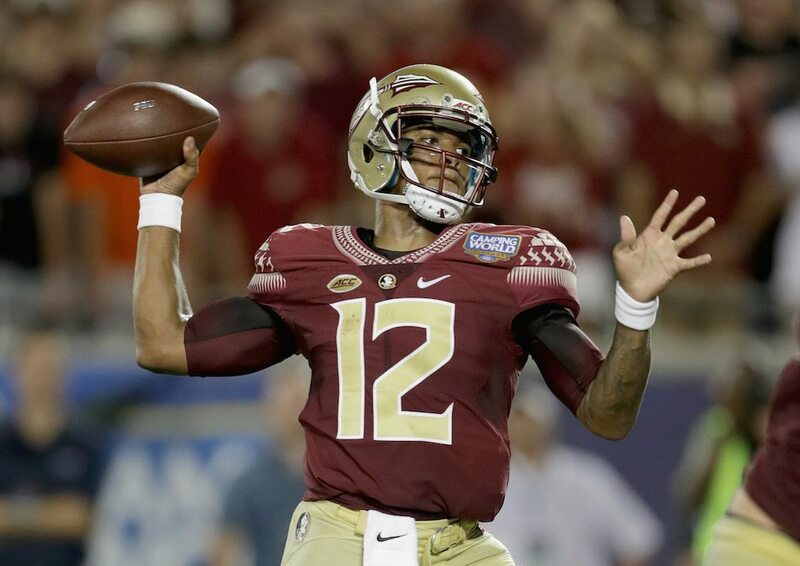 During a week when many freshman quarterbacks rose to the challenge, Florida State’s Deondre Francois might have been the most impressive of the bunch. During a contest in which the Seminoles at one point trailed 28-6, Francois remained completely unfazed (despite taking a pounding), and helped Florida State rally for a 45-34 victory. For his part, the freshman QB completed 33 of 52 passes for 419 yards and two touchdowns. Just like that, a new star is born in Tallahassee. 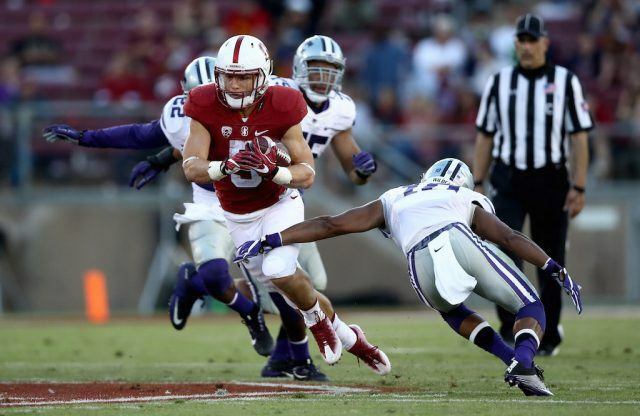 Even when teams do their best to game plan for him, Stanford superstar Christian McCaffrey still manages to make big plays. During the Cardinal’s Week 1 clash against Kansas State, we saw just that — and then some. Although the Heisman hopeful had a 97-yard punt return touchdown called back on account of an illegal block in the back, he finished the contest with 126 rushing yards (on 22 carries) and two scores, 40 yards receiving, and a whopping 210 all-purpose yards. We can’t wait to see what he does as the season progresses. Something tells us we’re in for something special. In his first game back since a season-ending knee injury a year ago, Georgia running back Nick Chubb reminded the rest of the country that he is a force to be reckoned with. As the Bulldogs knocked off the No. 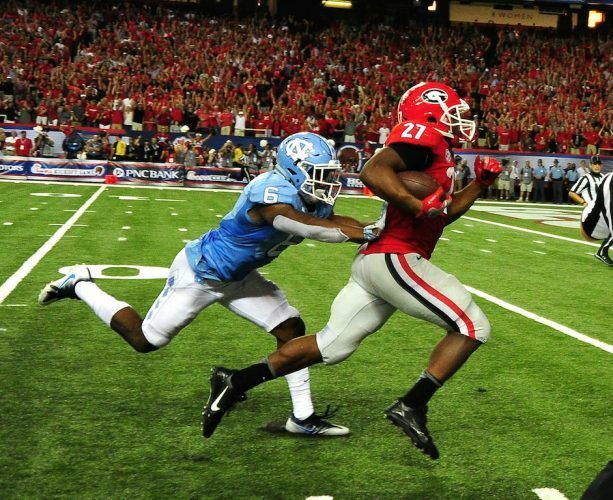 22-ranked North Carolina Tar Heels 33-24, Chubb used 32 carries to pick up 222 yards on the ground and two touchdowns. Welcome back, No. 27. You were sorely missed.